We had a great time, the hotel is in top condition. Staff were really nice and the breakfast was great. Rooms spacious and clean, in a great zone close to restaurants and bars. excellent service.. my check in process in twice my visits were exceptiobal.. excellent Food & service. Where to find La Macarena hotels near an airport? How can I find hotels in different La Macarena neighborhoods? Where can I find hotels in La Macarena that are near tourist attractions? Capital cities are often a highlight package of whatever that country has to offer. Their neighborhoods are often vibrant and energetic, attracting the country's brightest and best. The Bogota neighborhood of La Macarena, which is situated 13 kilometres (8 miles) from the capital's downtown, is no exception. The Monserrate and Plaza de Bolivar are two of Bogota's acclaimed attractions. The Bogota Botanical Garden shouldn't be skipped either. La Macarena is home to and nearby a number of popular Bogota visitor attractions, such as the Torre Colpatria and Cementerio Central. 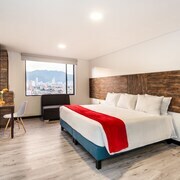 Located near the National Museum is the Hotel Casa Deco and San Pablo Hotel, while the Posadas House and Blu Inn Hotel are close to the Park Towers. Are you on a budget? 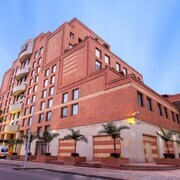 La Macarena's more economical accommodation options includes the ibis Bogota Museo. If you are looking for more hotel options, be sure to check out Expedia's Fontibon hotels guide. Fontibon is situated 12 kilometres (8 miles) to the northwest of central La Macarena. 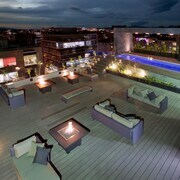 Or you could explore Expedia's Chico hotels guide for hotels in Chico, another Bogota neighborhood. 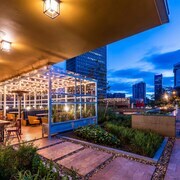 Expedia's Bogota vacation travel guide and Bogota hotels page can help you make the most from your journey. What are the most popular La Macarena hotels? Are there hotels in other cities near La Macarena? What other types of accommodations are available in La Macarena? Explore La Macarena with Expedia.ca’s Travel Guides to find the best flights, cars, holiday packages and more!